The best way to enjoy chicken Parmesan! 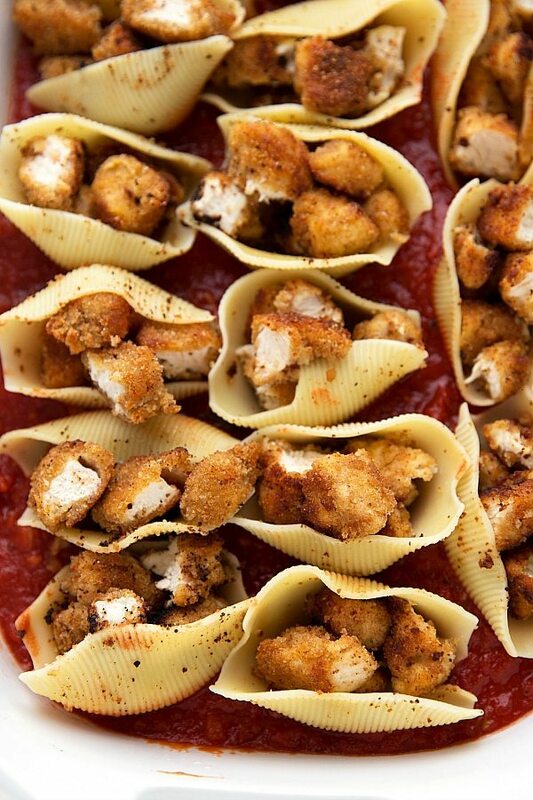 Delicious (double-coated) chicken with creamy mozzarella cheese stuffed into pasta shells and covered with a delicious homemade tomato sauce. My family’s obsession with chicken parmesan has been shared a couple of times on the blog; first with this slow cooker soup and then with this one dish quinoa meal. Both change up how chicken parmesan is traditionally made and coincidently both are served with quinoa. Also, both recipes have gotten such great feedback that it felt time to bring chicken parmesan back to the blog. It’s being changed up yet again, but it was finally time to bring some pasta in the mix! Pasta is generally always served with traditional chicken parmesan, so I thought why not stuff the chicken INTO the shells? The husband has a serious soft spot for stuffed shells. He goes NUTS whenever I make them. 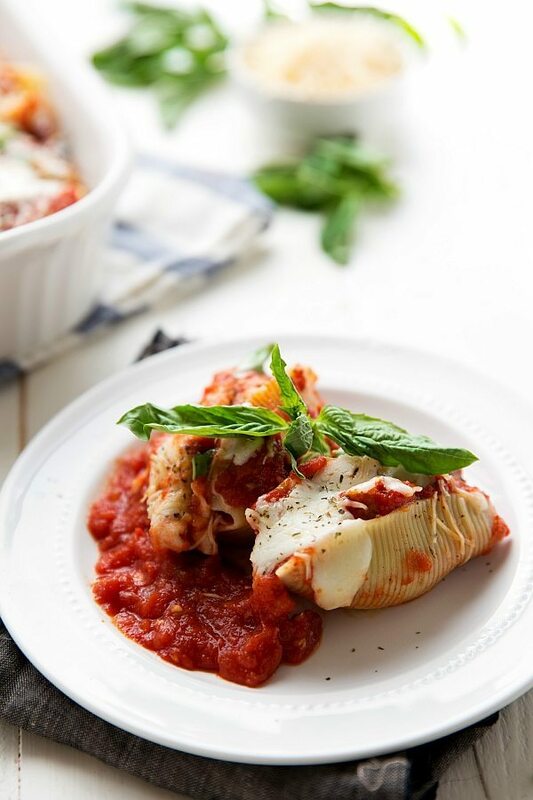 In fact, it’s kinda crazy I’ve never shared any stuffed shells recipes on the blog because I have quite a few that get made over and over again. Anyways, knowing how much he loves stuffed shells is what inspired me to make these. I was craving chicken parmesan and he had asked to do stuffed shells for dinner during the week. Naturally I had to combine the two and I’m so glad I did. Not only did he rave on and on about this meal and serve up helping after helping after helping….but I decided I liked it better than regular chicken parmesan by a whole lot. And the babe couldn’t stop eating these either! 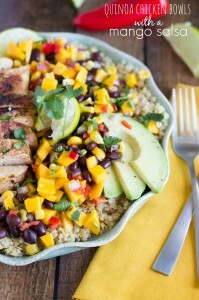 This isn’t one of my easiest dishes shared here on the blog. It’s not made in the crockpot and it’s not a thirty-minute stovetop meal, but it is well worth the effort. Not that it’s a complicated dish to make because it’s not at all, but it does take time to make. There are several steps in the process, but it is nice in the way that it flows — you are always working on something and before you know it, it’s ready to head into the oven. And if you are looking to please a crowd or make a fancier dinner that isn’t complicated (just slightly time consuming) this is your recipe! 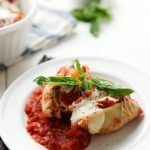 And now I need to start working on actually writing down some of my other stuffed shells recipes to share with you all! In a saucepan over medium heat, pour in the 3 tablespoons olive oil. Let the oil heat up and then add in the finely chopped onion and minced garlic. Cook until tender -- about 5-6 minutes. Add in the basil (coarsely chop or cut it with kitchen shears -- no stems) and then the cans of tomatoes. Add in the sugar and a generous amount of salt + pepper. Add in some Italian seasoning too if desired. Reduce the heat low and simmer the mixture, stirring occasionally. Simmer until the other ingredients are ready (shells and then chicken). Meanwhile, bring a large pot of water to boil and cook the shells pasta according to package directions. Drain, rinse in cold water, and set on a plate so they don't stick together. Remove any fat and cut the chicken breasts into a few large even pieces. Grab 3 small bowls. Fill up the first with flour (stir in some salt and pepper. Add some paprika if desired). Fill up the second with the 2 eggs. Add in 1 tablespoon of water and beat with a fork. Take the third bowl and fill it up with the breadcrumbs. Place the chicken pieces in the flour and lightly cover, then just wet in the eggs, and then dredge in the breadcrumbs (I used ALL of them for 1 pound of chicken). Repeat the process once more (double breading makes these super delicious)! Flour, eggs, and breadcrumbs for the second time. In a large skillet over medium-high heat, add in the 3 tablespoons olive oil and heat until hot. Then place the chicken pieces in the oil and cook for 4-5 minutes on each side (turn the chicken only once) until completely cooked through. Remove to a cutting board to allow to slightly cool. Slice the chicken into pieces that fill up the shells. Stuff the shells with the chicken and a little shredded mozzarella (the 1/3 cup). Pour and spread evenly 2 and 1/2 cups of the sauce on the bottom of a 9 x 13 baking pan. 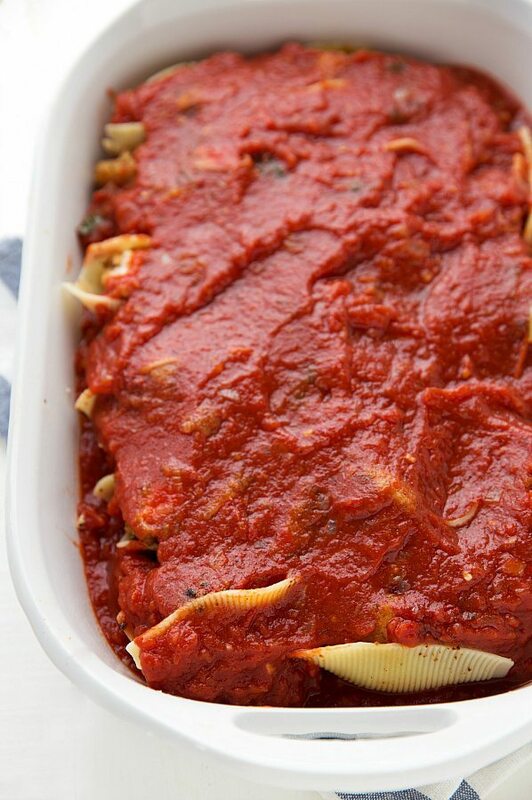 Place the stuffed shells right next to each other on top of the sauce. Cover with remaining sauce and top with remaining 1 cup mozzarella cheese and Parmesan cheese. Cover with foil and bake for 20-25 minutes. Remove the foil and bake for another 5-10 minutes or until the cheese is melted. If desired top with additional Italian seasoning and fresh basil. Aspects of the actual chicken parmesan adapted from The Food Network. 6-ingredient Mexican Salsa Chicken – under 30 minutes! My husband is also obsessed with chicken parmesan, so I know he would love this dish! Love that you breaded the chicken, Chelsea! Sounds so delicious and a fun twist! 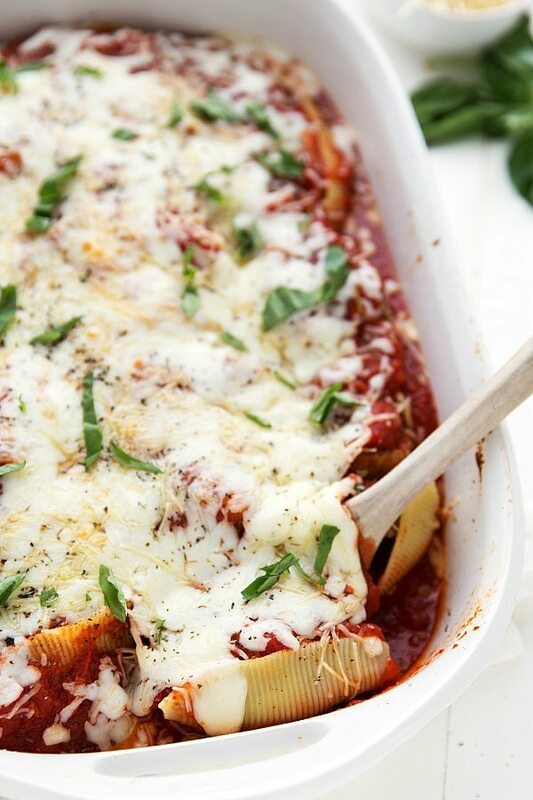 I love stuffed shells, but haven’t made them in a while, yours look so yummy! Pinning! My husband actually makes a mean chicken parm himself, so I am the chicken parm fanatic in our scenario and this looks absolutely mouth watering! I can’t wait to see some of the other stuffed shell recipes. Chelsea, I literally want to eat my screen- It may not be one of your easier recipes but damn, it looks ridiculously delicious. This seriously looks to die for! Cannot wait to make this- chicken parm is one of my all-time favorites! Can this be made up a few days in advanced and cooked later? I wouldn’t make it more than a day or 2 in advance! I was a little skeptical…not because of the recipe but because of my super picky husband (he doesn’t like change). I used Tyson breaded chicken patties (because it’s already been a long week) and made a variation of the sauce…held my breath while my husband took a bite and was pleasantly surprised when he said it was “actually really good”. And he went back for seconds…and thirds! Winning! Oh yay! I’m so thrilled to hear that; it makes my day! 🙂 Thanks so much for leaving a comment Tamara! Yay!! I’m so happy this was a hit and your daughter enjoyed it! (Happy Birthday to her!) Thanks for the comment Daphne! Could this recipe be made to the point of baking and then frozen for use later? If so, what would be the thawing, baking process? I’m just curious. It’s so good, we would love to have it more often but it’s very time consuming! I just have a question! In the recipe, it calls for 2 28 oz cans – crushed & peeled tomatoes.. is that 2 of each?! Yes! 🙂 So 56 ounces total!